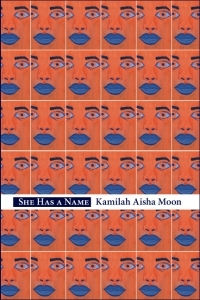 In her debut poetry collection, She Has a Name, Kamilah Aisha Moon satisfies a deep need to speak about her family’s experiences after her youngest sister was diagnosed with autism. Moon’s collage of loss, grief, and gratitude reveals a family that is undeniably close and poems that feel absolutely necessary. restless for ground. No, Lord, no. The poem makes room for the father’s grief. An empty nest is one kind of sadness, but this fledgling cannot fly away. No one has it easy. In the case of a family member in need of extra care, moral questions abound. The older and middle sister must work to individuate and, yes, leave home as most children do. Yet as the speaker of “(Middle Sister)” reveals, one sister’s autism diagnosis has ramifications for the other siblings: “We know ‘watch your sister’ means forever” (41). The line packs so much meaning into so little space, revealing the power of family vernacular. There is room for joy here, too. Moon takes mini-breaks from the collection’s official theme in order to honor and reflect upon other facets of experience—early childhood, coming of age, falling in love. In “Me and My Friends Circa 1981,” we enjoy a whimsical memory: “At least half of us walked around/ wearing constant Kool-Aid mustaches / and fresh knee scabs” (16). The self-deprecating humor gives way to a celebration of childhood play while hinting at hurts to come. Yet even in these poems of departure, away from the troubles of home, there is that needling theme again: what could have been. As Moon’s speaker admits: “Each visit home frays me, / the price I pay for being able to drive away.” (53) Survivor’s guilt is real. Profound truths like these abound in She Has a Name—even the title edges in a lesson, correcting acquaintances that neglect to ask a certain sister’s name. Moon’s poetry reveals the work of years—both on and off the page—though the truth in her poems may appear effortless to the untrained eye. The poetic muse has no doubt visited this “Express” bus: the poet sees suffering, feels it in her bones, and must write. Thus, a new vantage point opens up: the younger sister’s autism runs parallel to the poet’s own Negative Capability, to borrow Keats’s oft-quoted term. And autism does not stop the younger sister from performing a transcendent African dance, painting a “Possible Self-Portrait,” and speaking her own truths. From suffering falls wisdom, drop by drop. Personified Grief must find her way out, somehow, and this New York poem feels the tug of Southern roots. Let’s set all that aside for a moment, as we have been invited to a healing revival. Moon’s book bestows a parting gift, an argument for how to live after loss: “Why stay thirsty when / many draw from my well? / Why settle for shacks when I own / a sprawling, rambling heart?” (73). Pity is rejected in favor of self-affirming love. Wise readers will turn the page and greet this important literary debut by Kamilah Aisha Moon.